After the unpredictable winter we’ve experienced this year we know many gardeners and homeowners alike who are trying to get some color going in their gardens right away instead of waiting patiently for the regular perennials to make their appearance. Recently, we bought a hibiscus at a local store, as we do every year, and planted it in a pot and put it in the yard for a great pop of color amidst all the dull brown and buds that have yet to open. We hope the coldest days are behind us, even though we keep getting surprised by warm days followed by almost freezing nights. Many parts of the world have had severe cold spells and snowstorms, and for some of you, your hibiscus may have suffered. Many of us have gone out to our gardens after a cold snap to inspect the damage, and find it’s particularly disheartening when we see once proudly blooming hibiscus flowers now slumping over. There’s nothing sadder than the wilted, shriveled green leaves of a hibiscus plant that has been zapped by frost. But don’t give up hope! It’s rare for hibiscus to completely die in a quick winter freeze. Tips and branches die back, depending on how long and deep the cold snap was, but it takes a lot of sustained, deep cold to kill a hibiscus down to the roots. So take a deep breath, and follow these instructions from Hidden Valley Hibiscus. The amount and timing of pruning for your hibiscus depends on what kind of hibiscus it is, and where you live. Tropical hibiscus (Hibiscus rosa-sinensis) is hardy only in Zones 9-11. If winter temperatures dipped below about 20°F, and you have a tropical hibiscus, the plant is likely dead. You could also wait until spring to see if anything sprouts. Sometimes the stems die back, but new shoots arise from the base of the plant. Wait until the weather warms in spring, then prune back to where new, healthy growth is emerging. Hardy hibiscus (H. moscheutos) is root-hardy in Zones 4-9. Plants die back completely and can be cut back to within a couple inches of the ground in late fall or early spring. New shoots will emerge from the crown of the plant in late spring after the weather has warmed up. If you can possibly get your hibiscus into a warm place, do it as quickly as you can. If possible, move the hibiscus into your house and put it in a bright spot that gets little or no direct sunlight. If you can’t move it inside, try to protect it from further cold damage and make it as warm as you can. A freeze forces a hibiscus into dormancy, so for now you just want to keep it warm and let it rest and recuperate. Don’t give it any fertilizer or booster, and be very careful not to overwater. After a cold snap, more hibiscus die of drowning or root disease from soggy soil than from the cold damage itself. A damaged hibiscus draws up very little water, so give it little bits of water at a time, and make sure it uses what you give it before you give it more. Resist the temptation to pull off the wilted leaves. Wait to see which ones actually die and which ones come back to live enough to give the plant some support. The only products that have proven to be helpful for damaged plants are Growth Enhancer and Wake-Up Spray. You can use both simultaneously and easily. Just pour a capful of Growth Enhancer into a full bottle of Wake-Up Spray, shake it up well, and spray your sick hibiscus with it generously every day while you watch and wait to see how badly damaged your plant is. After your hibiscus has made it safely through a few weeks and is showing some signs of new growth and crisper leaves, it’s time to ascertain how much of your hibiscus was killed by the cold. You need to look at every part of the plant and determine which parts are still alive and which parts have died. First, check your plants for dead stems and branches. The test is simple enough. Working from the tip of each plant stem down toward the base, use a strong fingernail or a small knife to make a small scratch test (1/4-1/2 inch long). Scrape away a tiny bit of the brown outer bark of the stem that you are not sure about and look at the color underneath. A live branch will be bright green underneath the bark. If the branch is brown or light tan, it is dead. Some dead stems may be rotten, soft and squishy to the touch. There’s no need to do a scratch test on stems that are soft and squishy – they are clearly rotting and dead. Just keep working your way down the stem, doing scratch tests, until you find the point where scratching away the bark reveals bright, healthy, green plant tissue underneath. Plant tissue that is dull green with brown mixed in is not likely to live, so keep moving your way down the branch until you find a bright green patch. Now that we know where the live wood begins, it’s time to remove the dead wood. As with any pruning job, remember to have plenty of hand sanitizer with you. You should always clean your pruners quickly with hand sanitizer after every cut you make. This is especially important with a damaged hibiscus in case infection has begun in any of the dying branches. You don’t want to compound the cold damage by spreading infection into the clean, living parts of your hibiscus. So get in the habit of swiping with hand sanitizer after every cut. Also remember to put all pruned pieces into a trash bag, so you don’t leave potentially infected branches and twigs lying around your garden or house. When cutting dead or dying wood from the plant, there are two strategies you can use. The first is to find the highest spot of clean, live wood on a stem and then cut the stem 1/4 inch (1/2 cm) above the next visible node down from that spot. This will eliminate the ugly, dead wood and keep any disease from spreading downward. When you make the cut, the inner core of the stem should be clean and white, not streaked with dark stains. If it isn’t, then move further down the stem and keep cutting until you find good, clean, white wood. Keep in mind that the stem is likely to branch out from the node nearest the cut or from the 2-3 nodes just below the cut. Sometimes this is just fine, but other times that might make for a funny-looking plant with stems branching out near the top but not the bottom. The second pruning strategy is to shape the plant while removing the dead wood. You start the same way, by finding the point where the wood is clean, green, and white. Instead of cutting just above the first clean, healthy node, cut is made further down, just above a node that is pointing in the direction you would like a stem to grow. Be sure and cut 1/4 inch above the node, so that there is room for the new stem to sprout. If the cut is too high, the remaining wood above the node may rot. If the cut is too close to the node, you may remove the special plant cells that would have sprouted into the new branch. In this second pruning strategy, you remove more wood than is necessary to eliminate the dead wood. Some of what is removed will be white and clean but the idea is to force more stems to sprout lower down on the bush, to help it achieve a full and attractive appearance. You may cut away as much as 2/3 or even more of a branch in order to do this. Don’t be afraid to prune back many of the stems severely. The plant will re-grow with more branches than ever before and look fuller than ever before. More branches mean more flowers, too. Some of the dead wood on a hibiscus bush will just be twigs. Remove the dead twigs as close to the branch they were growing from as possible without damaging that branch. Throw them in a trash bag in order to dispose of them. A node is a definite bump on the surface of the stem where a leaf has grown or is growing. You can both feel and see it. The best node to choose when cutting is one with a leaf growing from it. If that is not possible due to all the leaves having fallen, don’t worry about it. Just choose a node that is pointing in the direction you would like to see a new stem grow in. Usually one pointing outward and upward helps make for an attractive bush. Sometimes, if the plant is too open in appearance, an inward pointing node is best, since it encourages stem growth to fill in the space in the middle of the bush. Sun, Fertilizer, and Spray, Spray, Spray! After you’ve pruned away all dead wood, and you know you only have healthy, live wood left on our plant, now it’s time to start giving your hibiscus some sun and fertilizer. Put your hibiscus in a spot that is warm and sunny, but not intensely hot. Try to find a place that warms up quickly in the morning, but provides shade during the hottest afternoon sun if you live in a very hot place. Fertilize at half strength once each week, and don’t use any Booster at all yet. You don’t want to encourage a sick hibiscus to start blooming! It needs all its strength to recover, wake up out of dormancy, and start growing. Keep spraying daily with your mix of Wake-Up Spray and Growth Enhancer. Don’t stop until you see strong new growth and new leaves. Once this happens, slowly stop spraying the Wake-Up Spray or your new branches will get very long and leggy. At this point, mix a capful of Growth Enhancer into a quart or liter spray bottle of water, and keep spraying daily with Growth Enhancer alone. At this point you can also increase your fertilizer to a low-normal weekly dosage, but don’t yet start Booster. It will take several weeks, depending on weather, before the new growth will come back. So be patient and give your hibiscus the time it needs. 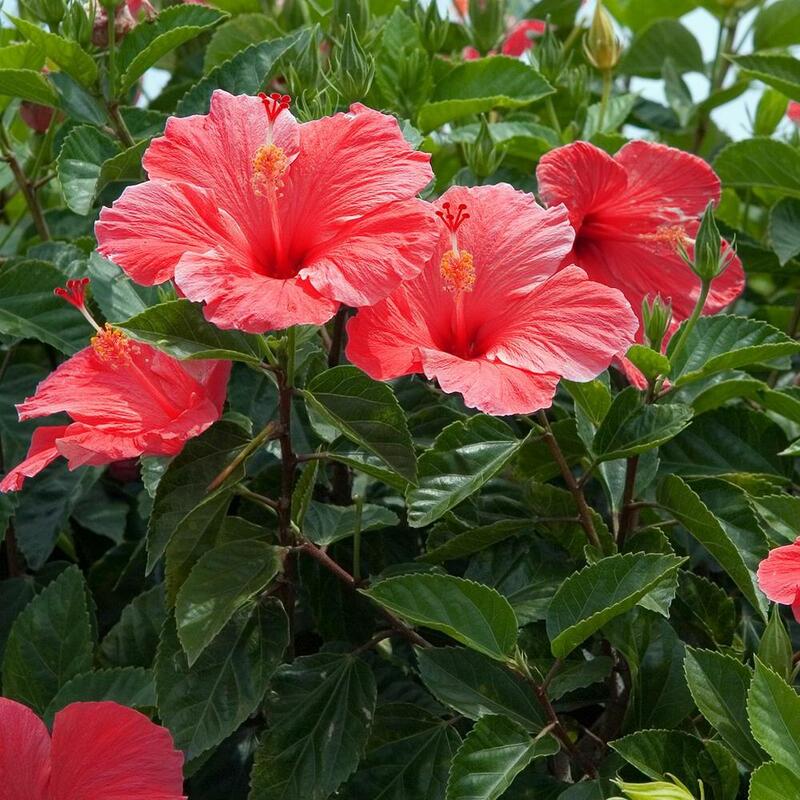 Once your plant is bushy and leafed out all over, you can go back to your full regimen of fertilizer and Booster, and let your hibiscus flower all it wants.